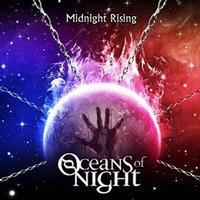 It seems to me that each album from Oceans of Night is better than the one that came before it. That says a lot, really. The blend of metal and prog is still intact. I’d still land this in the progressive rock arena, but I could see arguments about that. This is just such a strong album, though, that it never really matters where you put it genre-wise. Just enjoy it. That’s the point. A short, but very pretty, keyboard introduction sets up musical patterns. Those are continued by the guitar as it joins. The tune powers out from that in a great metallic prog arrangement. I love the multiple layers of powerful vocals on this piece. It’s a killer tune that just plain rocks. There is some powerful guitar soloing on this and the whole closing instrumental section is impressive. This comes in strong, but drops back as the introduction seems to have a bit of a tentative approach at first. Then keyboards take the lead as the whole rocking sound gets more consistent. As the vocals join the piece is more metallic. They take this through a number of changes and some sections are more decidedly proggy. I love some of the melodic guitar soloing on this tune. There is also some nice keyboard soloing in the later sections. There is quite a dense wall of sound on the early sections of this. While it does have a bit of a metallic edge and density, it’s also decidedly proggy. This is essentially an instrumental, but there are some spoken words. The second section is much mellower and this is just great stuff again. This pounds in with metallic fury but drops down to mellower, more decidedly proggy stuff for the first vocals. Weighing in at nearly nine-minutes in length, this song is extensive. It’s also very dynamic. There are some harder rocking sections that ensue later and some of them land closer to metal while others are definitely progressive rock. There are both powerful vocal performances and inspired musical passages on this number. It’s a real winner and one of the highlights of the set. This is heavy and quite metallic. Still, the song structure is pretty complex and there are some great neo-classical moments in terms of the guitar soloing to keep it proggy. The epic of the disc, this one is over ten minutes long. It’s more metallic in a lot of ways, but power-ballad-like. There are some more proggy sections for sure, though. An extended and powerful instrumental section takes it through several shifts and changes. Progressive metal and progressive rock merge on this number. It’s not a real standout, but it’s quite serviceable. The riff driving the introduction here is awesome. It’s thrashy and yet proggy at the same time. It’s rubbery and massive. That introduction runs for over two minutes and is awesome. Then it drops way down and they grow back out into a crunchy prog jam from there. Eventually it works back out to another thrashy jam. This instrumental is really a great one. Starting on keyboards, this works out from there to something a bit more typical of the rest of the album. The bonus cut is on the one hand pretty much cut from the same melodic prog as much of the rest of the album. The vocals of Stephanie Warren, though, make this one stand out.